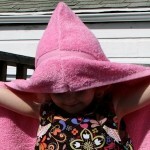 This is the third hooded towel that I have done. (To follow my progress, first was the plain version and next was the shark hoodie.) 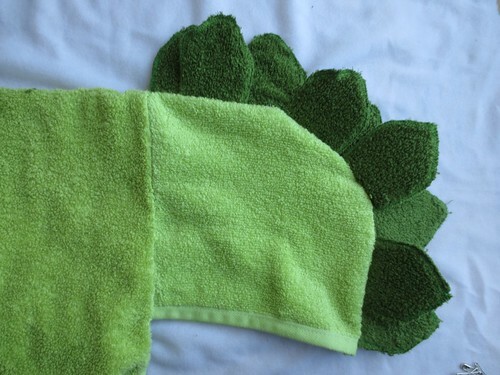 This one is done for a little dinosaur lover that we know. The directions for the hood itself can be found in the original post. 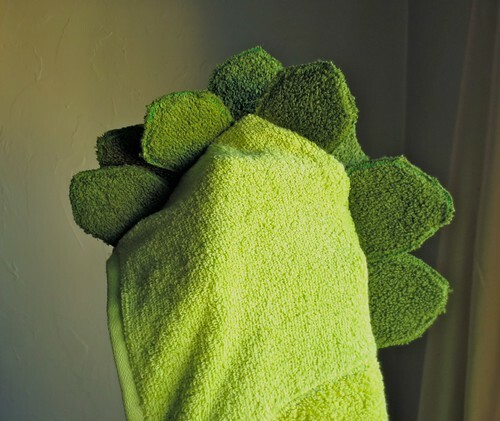 Hoodie Bath Towel. Read through that post to get an idea of where you are going. Note: On the Shark Towel that I made, I made teeth. I used white terry, and turned the teeth inside out. It proved to be very tricky. So for the plates, I used a different technique. Take the plate “sandwiches” you have made (terry, interfacing stuck to one side, terry = sandwich) and zig-zag around the edges. They move around a little bit, and that is a lot of fabric to run through a (my) sewing machine, so check them, and see that you caught both sides of the fabric all the way around. Some of them you may need to turn over and go around a second time. Open the hood up, and arrange the plates. They should be organized in layers, with the rough edge facing the seam of the hood. To make the plates point out to each side, set up two layers, staggered. A bottom layer, and then a second layer. 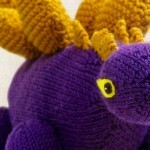 Be sure to leave a 1/2 inch at the neck edge for a seam allowance. Baste the plates to one layer of the hood so that they stay in place. (In the picture above, you can still see my baste stitches in white.) Set the second layer of the hood on top. Then stitch the hood together. Go across this seam several times for strength, as the hood will really take a beating. 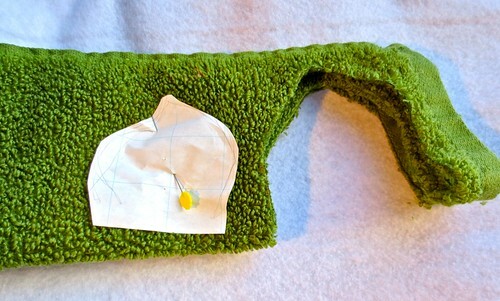 Next, open the hood up, find the center of the bath towel, and line that up with the center seam of the hood. Attach the hood to the bath towel. 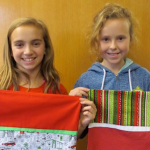 6 years ago by Susi in Crafty Mom , Needlecraft , Projects , Sewing , Sewing Projects | You can follow any responses to this entry through the RSS feed. You can leave a response, or trackback from your own site. This looks like it would be really popular with the kid set. Very adorable! The little dinosaur lover LOVED this! She wore it all day at school and was talking about how she was going to bring it to swimming class on Saturday. Thank you! 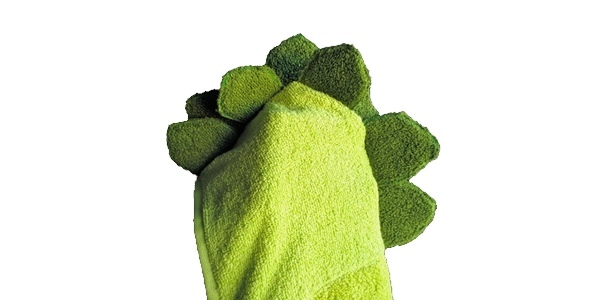 If they had body towels in the right colors–I would so make one of these and wear it at the gym. No, seriously. I would. 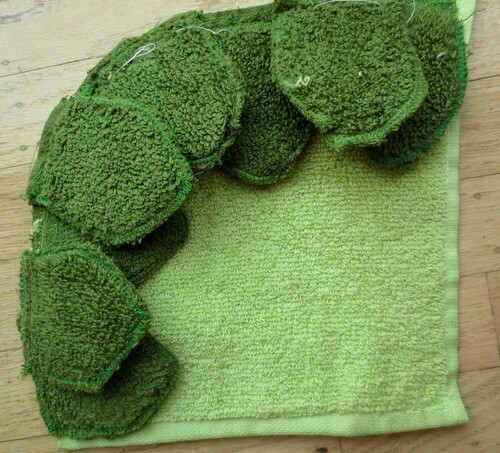 I love these sets of hooded towels you are making. 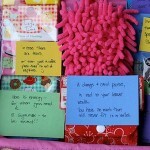 This is SOOO adorable and I hope you don’t mind if I share this on my blog. 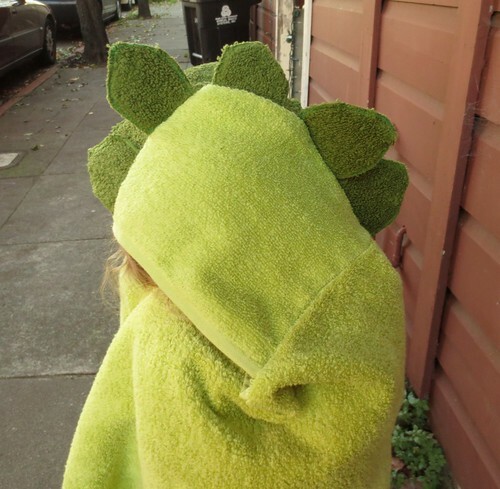 I just finished my first set of kid’s hooded towels and LOVE this idea for boys!